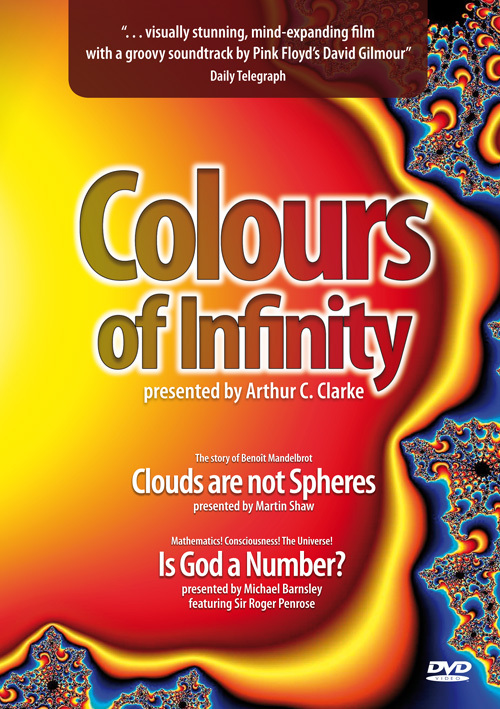 COLOURS OF INFINITY/CLOUDS ARE NOT SPHERES/IS GOD A NUMBER ? COLOURS OF INFINITY Presented by Arthur C. Clarke with music by David Gilmour, delves into the wonderful world of the Mandelbrot set and fractal geometry.CLOUDS ARE NOT SPHERES tells the story of the life and work of Benoît Mandlebrot. A great innovator and discoverer of the Mandlebrot set and fractal geometry - a highly regarded maverick mathematician.IS GOD A NUMBER? A fascinating account of the science of mathematics and its connection to mind and consciousness. Presented by Michael Barnsley featuring Sir Roger Penrose, the film looks at the mystery of consciousness, whilst exploring the links between mathematics, mind and the physical, observable universe. Music by Mood Swings.